Wait list and reservations made easy – without the fees. Guest List is the brand new restaurant guest list and reservation system from Heartland! Guest List is more than just a waiting list – it handles online reservations and restaurant seating management without the booking fees. It manages both reservations and walk-ins, so your host can quote accurate wait times. You can accept reservations from your website and they sync to the Guest List host stand automatically. Guest List helps optimize your seating capacity and improve table turns, allowing you to fill more seats and make overbooking a thing of the past. With Guest List managing tables has never been this easy. Every restaurateur dreams of a packed restaurant, but you need a reliable system to manage the volume. A crowded host stand can turn potential diners away. To prevent this, your host stand needs to be organized and calm, or you’ll turn away more guests than you seat. “Walk Aways” cost restaurants more than they often realize. Your host and hostess staff will find Guest List easy to use and feature rich. 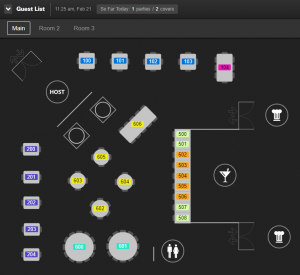 They can quickly view and configure seating maps, guest list and customer information. Using Guest List’s graphical interface you can effortlessly configure sections and tables, create multiple seating areas, making training and deployment to your restaurant fast. Colour coding alerts the host to walk-in guests who have been waiting too long. Tired of hearing about ‘unfair’ server rotation? Guest List assigns servers in turn. No more guessing or fussing. The seating chart-centric display puts everything at your host’s fingertips – literally. Manage wait times, servers, and reservations with a few taps, and even fewer screens. Reconfigure seating or an entire section for a large group; simply drag and drop. Guest List stays accurate up-to-the-minute, automatically syncing reservations with the waitlist, for smooth guest seating. Because Guest List is already in the cloud, it’s natural to offer reservations from your own restaurant’s website! Easily configure Guest List for the days and hours you’re willing to accept reservations, block sections, manage capacity, and establish the ideal balance between reservations and walk-ins. Customers will automatically receive a reservation confirmation email, and on the day of the reservation they also receive an emailed reminder. Restaurants don’t need to purchase and maintain expensive pagers anymore. With Guest List, hostesses ask customers for their cellphone number when they greet guests and accept reservations. When a their table is ready, guests receive an automated text or call on their phone, so they can leave and come back. Who likes to touch those dirty pagers, anyway? The importance of this “catch and release” strategy is that guests don’t need to stand in line at the front door, ultimately standing at the host stand, and crowding out new customers. Once you “catch” a guest and obtain their information, you can “release” them to continue shopping, take a walk, go to the bar for a beverage, and they know you’ll call them back when the table is ready! The result of better crowd management at the restaurant’s front door translates to more profit for the restaurant. Less crowding at the host stand means more walk-ins, fewer walk aways, more table seatings, more effective table turns, and more sales! Use Guest List in a Web browser or download the app to your favorite iOS or Android device. There’s never a per reservation fee. You pay a flat, fair monthly subscription fee. Actually, how does free sound? Use Guest List risk free for the first 60 days at no cost to make sure it’s a great fit for your restaurant. Now that’s something you should put on your list!